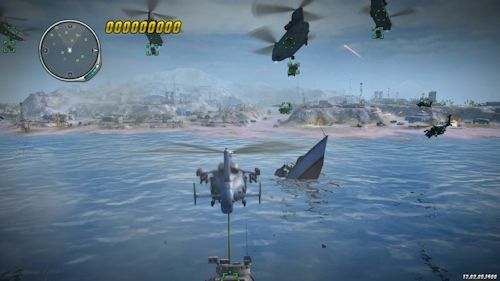 Other than Apache: Air Assault, we haven't seen much in the way of a true co-op helicopter game. There's a new arcade game on the horizon, set for release on the Xbox 360, PlayStation 3 and PC called Thunder Wolves. It's an arcade game in the truest sense, an in a way feels like a spiritual success to something like Desert or Jungle Strike. I played a recent preview build of the game to get a feel for it and it's two player local co-op mode. Graphically it's easy to see what the team at bitComposer Games is going for - lots of bright colorful environments across the normal myriad of landscapes like jungles, deserts, oceans, and more. There's a handful of helicopters to choose from, though you'll have to unlock them, and each one has strengths and weaknesses. One may be better at movement and missiles while another might have a more powerful machine gun or is faster. There's also several skins you can unlock to further customize the look of your chopper. Co-Op works with a gamepad and keyboard/mouse or a gamepad and gamepad combo. 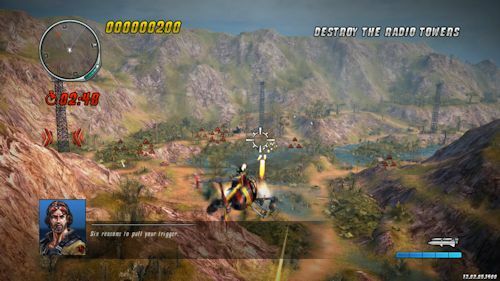 One player controls the helicopter's movements (the pilot) while the other player controls the shooting (the gunner). What's nice about a co-op set-up like this, rather than having two helicopters, is that you have a better range of attack on targets. 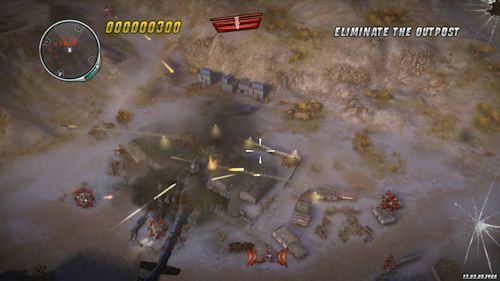 For instance in single player you have to face towards a target to fire upon it, while in co-op the gunner can simply aim the targeting reticule (within reason) away from where you are facing. This make sit easier for the pilot to worry about the danger and avoid it while the gunner is maximizing damage to the enemy. The missions I played were pretty straight forward, a whole lot of go here and blow up that kind of stuff. You're given a few different special weapons to use - for instance heat seeking missiles are great against fast moving targets - but for the most part machine guns and regular missiles get the job done on the land targets. Some missions to mix things up asking you to both pick up and drop off cargo using the helicopter's winch. As all good arcade games should, Thunder Wolves has a scoring mechanism that includes a combo system for doing well. I was sort of surprised to find that targets don't simply fall with one direct hit and at times it takes quite a few shots to destroy even a jeep or small vehicle. This slows the pacing down a tad, and while there's a lot of gunfire to avoid, it does make things a bit more manageable instead of just throwing hundreds of enemies that are killed with ease at you. Thunder Wolves is set to release on XBLA, PSN and Steam by June of this year. While pricing isn't quite set yet we expect to see a $10 or $15 pricetag. The game seems like a nice distraction from some of the bigger deeper titles out there while still offering a bit of value and replayability. In a way these more arcade like titles seems to have fallen off compared to what we saw just a few years ago. Thunder Wolves features two player local co-op play. Page created in 0.2961 seconds.